No one has more insight in the NFL than legendary quarterback Ron Jaworski. 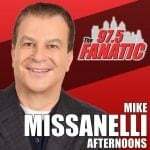 And if you’re looking for answers on the upcoming games, you will want to tune in to 97.5 The Fanatic for the Ron Jaworski Show each week during the football season. You’ll hear the latest news from an NFL expert just in time for the upcoming weekend games!